Crap broadband and the price of heating oil. They want to close down the main post office in a town of 70,000 people and do a concession in WHSmiths, no passport services etc. The rest of the post offices are in shops etc. I know you can do lots online but we have quite an elderly population who aren't online. Even our Tory MP is up in arms. Not in my area! A third of it is Grade II listed. We don't want residents disappearing into the river Nene. He's probably rebuilding it single handed, stone by stone. Done that in my town centre already!! Be nice. They are estimating £1.5 million. Nice little earner. Watch too the banks disappearing from the High Street. I wrote about that over 25 years ago. I avoid it because there's always huge queues. The buiding though is bigger than they need and in a good location. It's my nearest one, the next nearest is a corner shop. They also moved the sorting centre onto an industrial park, which is fine except it's close to a school so loads of traffic and it's off the busiest road in town further adding to traffic in that area. That said someone also built a huge housing estate on the old rugby grounds (team has moved to out of town) which is before you get to the estate so I don't think the council gives a toss. See the Internet threads for an explanation. The bridge is in three sections. The stone bit is the listed bit, over the river. The rest is built on blue and red brick. I'm sure you are all terribly interested. The problem was identified in 1983. The County Council did lots of ground radar etc. for four years and never told us about that, then dropped a grenade on us. It's a scandal. We are going after them big time. Our finances are sound. They are £60million in debt, taken over by Government officials and the likelihood of two unitary authorities. But. They outsourced their Highways division to Kier WSP. Look them up. They are not a charity in any way or fashion. Sorry to bang on but this is serious business. He predicted that as well. I just saw it coming Gwenno. Assets, leases, staff, maintenance etc. when you can get the public to do the work on-line. Got into real trouble over that paper. We were acquiring loads of other sites, at an alarming rate, and it was Board policy to get a High Street presence. I pointed out the "elephant in the room". Luckily my great late mentor JS looked after me. I spent a short while in the shadows but bounced back after several others backed me. Prediction was my job and still is. I'm looking at the potential impact of an ageing population in my Town. I'm probably in that bracket. But I don't get paid for that. I had a quick look at it. It's f**ked. I had to look that up! Having got first married there (NI that is) I really ought to have known that. Salem is known to me. Glad you agree. I have just applied for a shotgun certificate. I intend to use it peaceably. But, honestly, you cannot believe the ineptness about this. They never had a word with us about this then just bunged in a proposal which is ludicrous. We have all the surrounding parishes up in arms. But. They will try to stick to their guns (ha!). Having decided their way to go (which means a lot of people have a "way to go") quite literally, they are digging in. We have a structural engineer on the Council. I'm no slouch in that department either. We have a Freedom of Information out on this. We smell a rat. Why weren't you still in the pub!!! Last edited by SaintK on Mon Oct 22, 2018 5:31 pm, edited 1 time in total. Why weren'y you still in the pub!!! People stealing stone paving slabs from footpaths, the dirty chav cúnts. And the fact the council fills in the gaps with tarmac rather than new slabs despite it being a conservation area and it looking awful, the cheap fúckers. Commiserations HH. When I first married my wife and I rented a house in Caernarvon Road in Norwich. The next door neighbours decided to "renovate" their flat next door. He was drilling holes at about 3.00am. He was also indulging in drilling his partner's hole as well. She was a screamer. We got the whole nine yards on a Saturday when they'd been to the pub. Thankfully, I did our place up, the landlady was most effusive as I got rid of the damp and rodent infestation. Her son and I were rally partners. Went for a cycle up round the Gobbins recently, lovely spot. Definitely wouldn’t fancy getting thrown off them head first mind. Marijuana, have you bought any yet? What's your opinion on the legalization of it? Living in a very rural farming community that's seemingly shrinking, the mayoral candidates are all seemingly concerned with how to attract small businesses (if not larger) to generate growth and jobs, but also to keep people from fleeing to suburbia. Continuous fractions and why e is more irrational than pi, but not as irrational as phi. How can it be more irrational? Typical Irish fare for any time of the year really. A memorial to the eight women convicted was proposed by the author Martina Devlin. However the memorial was objected to by TUV councillor Jack McKee who believed the plaque could become a "shrine to paganism" and furthermore stated that he wasn't convinced the women weren't guilty and that he believed the proposal to be "anti-god". The weather, the state of the A55, the weather, the third Menai crossing, the weather, the disappearance of local Post Offices (bit of a theme here) and the weather. 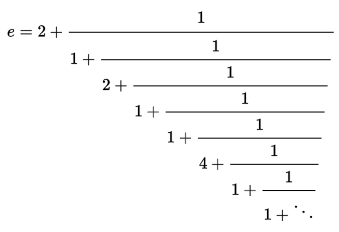 if you cut the fraction at various points you get pi approximations like 22/7, 333/106, 355/113, 103993/33102 etc. Each cut is a more accurate approximation for pi. So far so good. On the continuous fraction you will see the 292 line, and at this cut off the pi approximation jumps in accuracy by 3 decimal points. In a sense, the larger those numbers ( 2, 15, 1, 292, 1, etc...) the better the accuracy jump, right? No big numbers for aaaaaages in e, so its approximations settle down a lot slower than pi. The slowest improvement in approximations of all.